Former President Bill Clinton did not have culinary relations with that soda, Coca-Cola. Even if you’re just incidentally familiar with various aspects of nutrition and health, Fed Up won’t tell you much you don’t already know. However, Stephanie Soechtig’s documentary is still fascinating, compelling, and maddening – an efficient look into how when combating rising weight gain rates in the United States, taking the steps to eat healthier and exercising more is only half of the picture. It’s a searing indictment of the way that we handle consumption of processed sugar, how fast food industries have been creeping more and more intrusively into our everyday lives, and how younger people (i.e. around my age) are fighting the largest uphill battle in this regard. It may not be perfectly paced or introduce much new information, but it gets the job done. 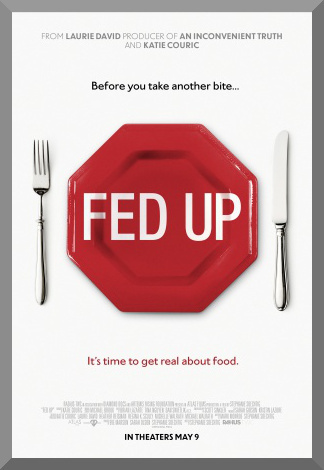 Fed Up starts with narrator Katie Couric giving a voice over about how obesity started out as a “small story” for the news, and its subsequent ballooning into a top health concern over following years was largely unexpected. All of this happens over a shot of a CGI food pyramid, superimposed with news clips concerning the subject, and miscellaneous stock video illustrating much of the movie’s buzz-imagery (like a buzzword, but visual). This is indicative of the kind of style to be seen over the next 94 minutes – interviews sometimes peppered with bright, flashy graphics, almost too sunny for demonstrating the serious issues that the film addresses. But it’s better than non-stop talking head droning, I guess. They’re a mixed bag, that’s for sure. Sometimes they work, like in a scene where one of the documentary’s child subjects talks about the food they eat in an average day, and how this set of seemingly normal sounding meals and portions still easily shoot up sugar intake way past daily recommended values, with a thermometer-like invention filling up, up, up as the amount of processed and added sugars in everyday meals are calculated. But sometimes they don’t work, like in a scene where an expert’s discussion about how all calories and sugars are not alike, using the difference between 160 calories of almonds and 160 calories of Coke, gets the overdone freakshow of a mechanized animated liver inside an animated human body pumping and processing the food while it tinkers down a digestive tract, making cartoonish noises, bouncing of the interior walls. It gets a bit too kiddy sometimes. Speaking of kids, one of the main arguments of Fed Up is how the worst victims of an era of big sugar and lack of proper dietary guidance are the under-18 demographic. To get this point across, we see the stories of several people in their pre-teen to mid-teen years, individuals who can’t seem to lose weight, no matter how much they diet and exercise, in a constant war with obesity. Fed Up structures these early stories as a mystery, before launching into possible answers. Interview subjects range from former surgeons general to former presidents, but one noted exclusion from the film is First Lady Michelle Obama. A title card at the end of the movie mentions that she declined to be interviewed, alongside nearly every major food corporation in the country. Her “Let’s Move!” campaign gets a bit of a takedown here, depicted as unwilling to trace the obesity problem to the responsibility that many of said corporations hold in spreading it. Fed Up isn’t a very great documentary. Sometimes it feels like a bit of a trudge, repeating itself at length and making itself feel needlessly long. And there is that problem of the movie’s own overprocessing in its delivery, feeling nearly unintentionally artificial. And besides some alarming statistics about where the public health of Americans will be if something isn’t done soon, as well as the role the U.S. government has taken in flat-out extorting the WHO, threatening to withhold money unless they would rescind the publication of sugar intake guidelines in 2002 because they would harm the food industry, the film isn’t exactly a trove of never before mentioned knowledge. But you should see it. It’s still well made to the point of working, in spite of its shortcomings, tackling a prevalent issue that, despite growing prominence and risk, people just don’t seem to care as much about as they should.